Party Poker is not a front end for another operation, but its own unique network. It is important to note that due to legislation in the United States Party DOES NOT currently accept US customers for real money games. Those living outside of the United States will be able to enjoy real money cash play at one of the most well known poker rooms today. Before the Americans passed their prohibitive legislation in 2006, Party Poker was the place to play online poker. It still is for many people outside the US, but has since dropped in overall popularity. Many US players were very disappointed to have to leave the “fish fest” that Party Poker always was. At Party Poker you will find No-limit, Limit, and Pot-limit Holdem, Limit and Pot-limit Omaha (and Hi/Lo), and 7 Card Stud. Most of the cash game players are attracted to No-limit Hold em and there are many full tables for every stake. One will notice that they have regular tables as well as jackpot tables listed throughout their games, but we highly recommend avoiding the jackpot tables if you can. These tables have an additional rake that can greatly impact ones win rate. If you also like to play Omaha or Stud, there usually are some tables running. However, most of these tables are low-to-mid stakes and only rarely it seems that a high stakes game is being played. Tournaments at Party Poker are very popular, perhaps more so than the cash tables. There are hundreds of Sit & Go tournaments being played at the same time, with the most popular being in the $3 – $11 range. Off peak there are multiple tournaments running at $55, but rarely any higher than that. They also offer up to 5-table Sit & Gos, but only limited to a maximum $33 buy-in and generally these do not fill up very fast. This is one of the best online poker rooms for mid-stakes Sit & Go players today. Multi-table tournaments also have quite a large turnout. They have many daily guaranteed prize pools, which usually shatter the minimum announced amount. Their regular tournaments range from $1 + R ($1000 guaranteed) to larger buy-ins such as the Super Saturday, $300 + $20 ($50,000 guaranteed). The smaller buy-ins usually host a field of around 500-600, and higher stakes can get around 150 people. Their weekly Sunday tournament has a $200,000 guaranteed prize pool ($215 buy-in) and usually hosts 1000+ players. Party Poker also offers many daily freerolls in the $100 to $1000 range (some exclusively for new players) and those fields can be as large as 5000 players. While playing for real money at PartyPoker, you will earn PartyPoints. The more PartyPoints you earn, the higher your VIP level (4 levels, Bronze through Palladium) and the better the benefits you will receive. The best use of PartyPoints has to be the Cashback % bonuses. These bonuses work like rakeback which is built right into Party Poker and players can earn up to 30% in Party Poker Rakeback! Simply climb up the VIP ladder, play lots of poker, collect PartyPoints, then change them in for cash! 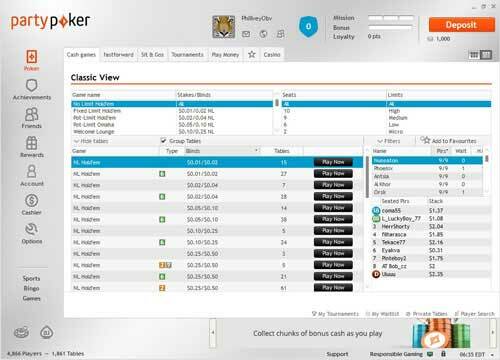 If you have been playing at Party Poker for years, one thing you probably noticed is that their software has remained pretty much the same. There had been a few updates and new features added, but it has always had the same familiar look and feel. However, that all changed with the launch of their last update. As shown in the screen shots above, this is what the new PartyPoker looks like! The lobby has a similar style to the original, but has a lot of new features. The first thing you will probably notice is that it is HUGE! Party Poker used to be the largest online poker site in the world, but since banning US players it has dropped down a few spots. It is definitely still near the top and this is largely due to the release of its software in multiple languages, enabling many different nationalities to easily play in their native tongue. Because of this, you can expect action at every limit and in every tournament. There are thousands of tables running at once, so you can definitely find a game you want to play. At any given time there can be more than 10,000 players sitting at their real money tables. Their smaller stakes games are the most popular; players should be able to find a large number of tables running up to $5/$10 NL and $2/$4 PLO. Their SNGs are always running and small-stakes grinders will find plenty of different formats that fill quickly through out the day. For tournaments, PartyPoker runs a lot of guaranteed events with different buy-in levels and structures. On weekends Party rivals some of the bigger sites online with a $200,000 guaranteed major event with a $215 buy-in. Party Poker’s reputation was built upon being the largest and fishiest website back when it first debuted. Although it isn’t the largest anymore, it still holds true to the fish part. 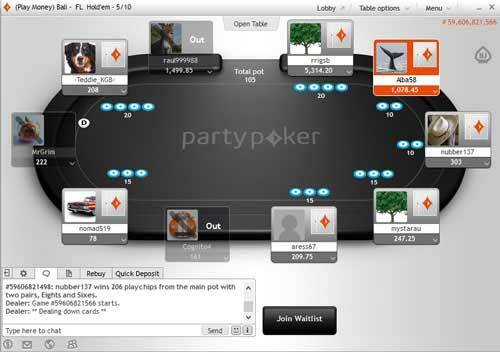 Many people who still play at Party Poker feel it is the easiest site to play on today. This is one of the reasons there was such a huge impact when its doors were closed to US players. Many people didn’t know where else to go. Where else would the games be as good? So, if you are lucky enough to be located where you can play at Party Poker, you will find many fish to be caught. It should be noted that while their smaller stakes games remain quite soft and full of bad players, their higher stakes games are considered some of the toughest found online today. It seems all of the European fish have stayed at the $.25/$.50 to $2/$4 level and most of their games at $5/$10 and above have become populated strictly by regulars who are solid players. Party Poker is always coming up with new promotions for players – see them below. PartyPoker is currently offering new first time depositors $22 free in tickets. All that is required is a deposit of at least $10. Once your deposit is made, make sure to accept the bonus offer within 14 days, you will then receive your tickets within 48 hours. These tickets will be given as 4 x $5.50, which can be used to play in various satellites. The tickets must be used within 7 days. See our Party Poker bonus code page (Use the bonus code FTR500 when creating your account) for further details on this offer. Party Poker has certainly improved their customer support over the years. They have recently added a live chat option that should help players get any and all problems solved quickly. Players can use this option from the Party Poker website. Their contact page also has other helpful information including email addresses, phone contacts, and an in-depth FAQ section.